I (Aaron) felt compelled to write this post not about a particular wine but about the best tasting experience I’ve ever had. I should acknowledge I find tastings appalling. The sales-focused experience which almost guilts you into buying something is rarely relaxing, commonly crowded and almost never worth the “tasting fee”. Therefore please consider when I recommend visiting Goldeneye Winery in Mendocino County to enjoy the most relaxed, pleasant, classy tasting experience I’ve ever heard of. We arrived at the Duckhorn-owned property expecting the traditional setting of “belly up to the bar while someone who must be an expert on wine blabs at you ab out what you’re tasting”. In contrast, the friendly faces who greeted us quickly poured some Chardonnay and directed us to find a seat indoors or on the patio where they would serve the remaining wines. We sat down and within a few minutes were shocked to see a large tray of 10 individual glasses brought to our table. A specific card boasting extensive information on each wine was placed in the proper tasting order and our wine steward gave a brief overview as she sat each glass on the table. A pricing sheet was of course provided and were we left in peace to relax on a beautiful vineyard-looking patio and enjoy our buffet of wines. I should note: 1. These wines are pricey ($50-100). 2. Each wine was amazing. Even if they weren’t however this tasting experience was magical. Wines were served in individual, classy Reidel stemless glasses, each paired not only with almonds and dried cherries, but extensive information which you could study at your leisure. 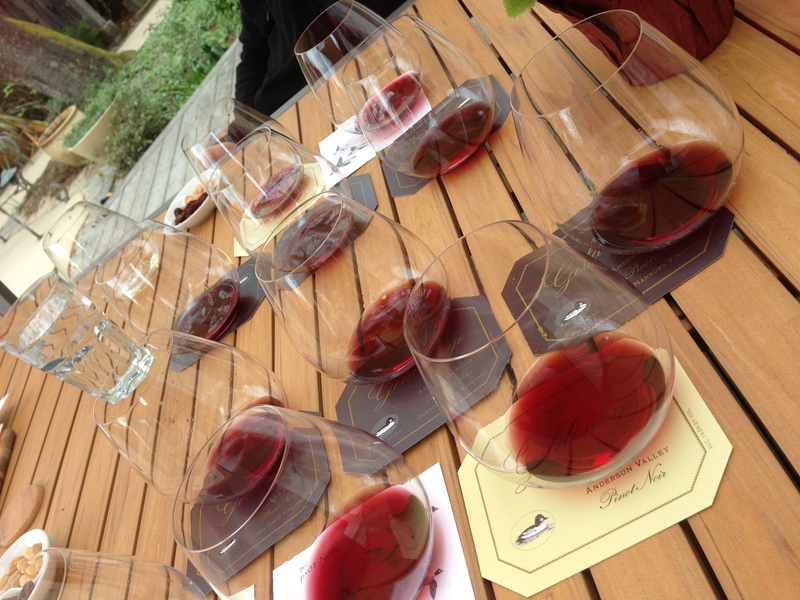 In summary, this is what a wine tasting should be! Tasting room attendants were helpful and checked on us but weren’t pushy and did not try to sell us anything. Particularly for smaller vineyards who must deplete their inventory to run a tasting , I am fine reimbursing a winery for the expense of my tasting, but frankly these have become outrageous. Goldeneye has a $15 fee per person which is worth every penny plus a generous tip. This is one of the first times I’ve felt I got my money’s worth for anything beyond a $5 fee. Thank you Goldeneye for reminding me wine should be enjoyed while relaxing not sipped awkwardly in front of a salesperson. Thank you also to Janelle our very friendly and attentive new friend at the winery who was kind, knowledgeable and enjoyed her job, making the experience that much more pleasant. 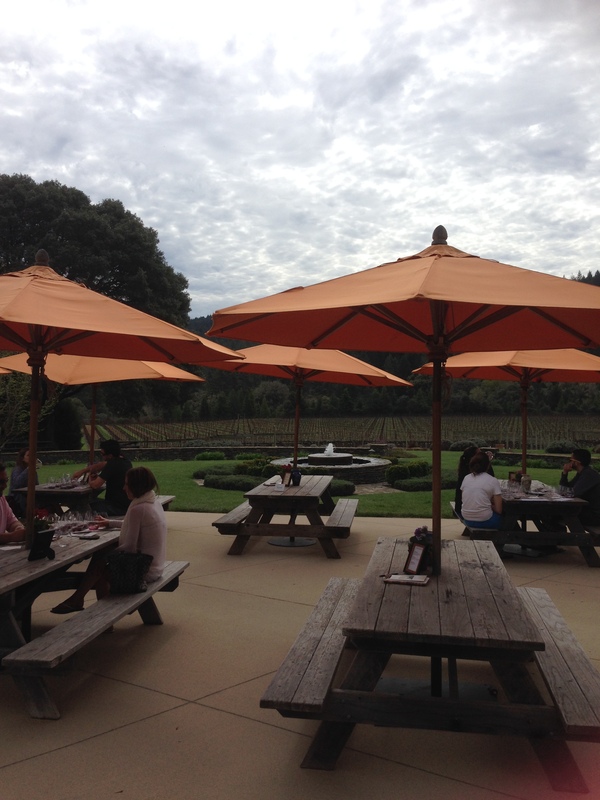 This entry was posted in Uncategorized and tagged experience, Wine Tasting by aaronandteri. Bookmark the permalink.